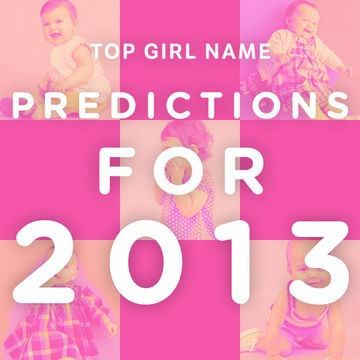 With the official release of the most popular baby names of 2012, we've rounded up the top girl names and predict whether or not they'll make the list for 2013. A Greek name meaning "wisdom," Sophia has been popular in English-speaking countries since the 1600s. Previous ranking: 2012 is the second year in a row that Sophia has been at the top of the girls list, with a second place finish in 2010 and a fourth place rank in 2009. Our 2013 prediction: According to the U.S. Social Security Administration, the name Sophia began its meteoric rise to the top in 1990 and, despite a small dip in 2008, hasn't looked back since. The name should be a top finisher again in 2013. A German name meaning "universal," Emma is a shorter form of similar names including Ermen and Ermintrude. Previous ranking: Moving up the list to number two in 2012, the name Emma ranked third on the list in 2009, 2010 and 2011. Our 2013 prediction: With Hollywood starlets Emma Stone and Emma Watson stealing hearts worldwide, we expect to see the name hang on to top five ranking in 2013. A Hebrew name that means "pledged to God," Isabella has been a popular name of European queens for centuries. Previous ranking: Making its place in the top three girls names for the past four years, Isabella reigned supreme in 2009 and 2010 and ranked second in 2011. Our 2013 prediction: A popular name with literary buffs (William Shakespeare used the name well before Stephanie Meyer), movie stars Matt Damon and Tom Cruise also have daughters named Isabella. We wouldn't be surprised to see it among the top three in 2013. Previous ranking: With consistent finishes in the top five the past four years, Olivia ranked fourth in 2010 and 2011 and third on the list in 2009. Our 2013 prediction: With actresses Olivia Wilde and Olivia Munn earning more screen time, it's likely Olivia will join Sophia, Isabella and Emma as a contender for the top spots of 2013. Used for both girls and boys, the name Ava is of Germanic origin and may be derived from the Latin word avis meaning "bird." Previous ranking: The name Ava has taken the number five spot on the list since 2009. Our 2013 prediction: A popular choice among celebs like Reese Witherspoon, Hugh Jackman and Rachel Roy, expect non-celebs to keep the name going strong this year.